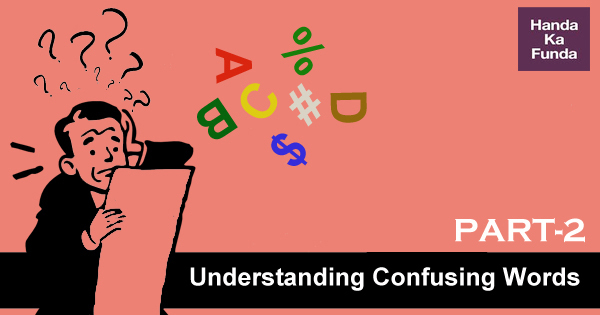 In the Understanding Confusing Words – Part 1, we discussed confusing words. As discussed Learning New Words – Why, How and Strategies, these words are not directly related to CAT prep for the vocab section or for any MBA exam (so don’t expect direct questions based on these words) but knowing the right words and the correct usage will make your job much easier while attempting questions. Let us extend the list with a few more words. Prescribe vs. Proscribe – These similar sounding words have very different meanings. Prescribe is the more common word, and it’s often used at the doctor’s office. For e.g. If physicians want to help their patients, they need to prescribe affordable medicines. Ingenious vs. Ingenuous – Both ingenious and ingenuous are adjectives. Ingenious indicates cleverness or intelligence, while ingenuous refers to sincerity or a naive nature. Ingenuous can be used to mean sincere or candid. It’s also another way of saying naive or unsophisticated. Libel vs. Slander – Libel and slander are both types of defamation. Defamation is the act of making negative statements that hurt another person’s reputation. Libel is written, published, or broadcast defamation, while slander refers to spoken defamatory statements. Slander describes spoken defamatory statements. The term applies to in-person interactions, like standing inside a restaurant and shouting false accusations about its sanitary conditions. Slander is harder to prove. Loathe vs. Loath – The definition of loathe is to feel intense dislike or disgust for someone or something. For e.g. I loathe reality television or At the beginning of each week, I am reminded of how much I loathe Monday mornings. Loath is defined as unwilling or reluctant, disinclined. For e.g. The coach seemed loath to complimenting his players, fearing it would fuel their egos. If you are loath to do something, you are reluctant to do it. If you loath something, you hate it. You can remember that loathe is the verb because it ends in a t-h-e as do the verbs breathe, bathe, and clothe. Alternately vs. Alternatively – Alternate means following by turns, one after the other or a substitute. The adverb form is alternately. For e.g. The captains alternately chose players for their respective teams. Alternative refers to or implies a choice between two things. As a noun, it refers to the other choice. The adverb form is alternatively. For e.g. If the flight is grounded, our alternative is to travel by train. Imply vs. Infer – To imply is to hint at something. For e.g. By their very definition, flea markets imply cheap prices for used and unwanted items. Infer is on the receiving end of imply. To infer is to gather, deduce, or figure out. For e.g. Women are better at inferring feelings from images of just the eyes. Assent vs. Ascent – I am sure you know about American and British accents. So let’s focus on how ascent and ascent are different from each other. Ascent means the act of rising or moving upward or an upward slope. It’s the opposite of descent. For e.g. The ascent up the mountain was long and treacherous. Assent means agreement. Assent may also be used as a verb meaning to agree. For e.g. Before we proceed with construction, we need to reach assent on an action plan. Vain vs. Vein vs. Vane – Vain, vane, and vein are all homophones. But none can be substituted for any other without altering the meaning of the sentence. A person who is vain may be obsessed with his own appearance or think very highly of his abilities. For e.g. She is so vain; she thinks every song is about her. Vein, on the other hand, refers to blood vessels that return blood to the heart. Vane is short for weathervane, which is a device which spins to show the direction of the wind. Both vein and vane are nouns. Just remember – when you want to discuss a quality, use vain. Avenge vs. Revenge – Avenge is a word that connotes a pursuit of justice for someone other than one’s self. It suggests punishing a person when someone is looking to vindicate someone else other than himself or herself—or is serving the ends of justice. For e.g. We will avenge your son’s death. The victim was avenged after the shooter was sentenced. Revenge is a more personal form of vengeance and is usually centers around feelings of anger and resentment. For e.g. He was so blinded by a desire to get revenge or It was difficult not to be overwhelmed by feelings or hate and revenge. Avenge is a word broadly concerned with inflicting a punishment or penalty in the pursuit of justice. Revenge is a word broadly concerned with inflicting harm or punishment for personal retaliation. Counsel vs. Council – A council is meeting for discussion or advice, but to counsel is a verb meaning to give advice. Council is a group of people who get together to figure something out, or a group chosen to give advice, like a student council. As a noun, counsel is a synonym for advice, but it can also mean the act of giving that advice or refer to a person who gives legal advice. In fact, a lawyer who goes to trial for you is your counsel. If you need a verb or a lawyer, use counsel. If you are referring to a meeting or group, use council. Reign vs. Rein – Reign means to rule or to possess supreme power over something or someone. For e.g. Queen Elizabeth I reigned over England between 1558 to 1603. Complimentary vs. Complementary – To complement, means to complete or supplement something. If you remember your elementary quant for your MBA exams, you may remember complementary angles which are two angles the sum of which is 90 degrees. This should give you some intuition about complementary. To compliment is to offer praise to or admiration. This could be in the form of words or actions. You might compliment someone on her dance moves, for example. “Your moonwalk is perfect!” is a compliment. Until then, I leave you with this joke: A man walked into a bar after a long day at work. As he began to drink his beer, he heard a voice say “You’ve got great hair!” The man looked around but couldn’t see where the voice was coming from, so he went back to his beer. A minute later, he heard the same soft voice say “You’re a handsome man!” The man looked around but still couldn’t see where the voice was coming from.